Garlic chives can be used in the same manner as chives. 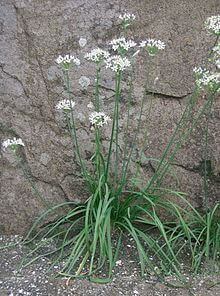 They are distinguishable from chives by their flat, broader leaves and fragrant white flowers. Used widely in Asian food, they bring a slight taste of garlic in the same way that chives bring a slight taste of spring onion.